Rent villas and apartments in Rotheneuf-Le Pont, France with swimming pools. Book affordable holiday rentals that are near a beach and golf course. This 3 bedroom house is located in Rotheneuf-Le Pont and sleeps 6 people. It has WiFi, a garden and barbeque facilities. The house is within walking distance of a beach. This 2 bedroom apartment with swimming pool is located in Rotheneuf-Le Pont and sleeps 6 people. It has WiFi. The apartment is within walking distance of a beach. This 1 bedroom apartment with swimming pool is located in Rotheneuf-Le Pont and sleeps 4 people. It has WiFi. The apartment is within walking distance of a beach. This 2 bedroom apartment is located in Rotheneuf-Le Pont and sleeps 6 people. It has WiFi, parking nearby and a gym. The apartment is within walking distance of a beach. This 1 bedroom apartment with swimming pool is located in Rotheneuf-Le Pont and sleeps 4 people. It has WiFi, a garden and garage. The apartment is within walking distance of a beach. This 3 bedroom apartment with swimming pool is located in Rotheneuf-Le Pont and sleeps 6 people. It has a garden, garage and parking nearby. The apartment is within walking distance of a beach. This 2 bedroom apartment with swimming pool is located in Rotheneuf-Le Pont and sleeps 4 people. It has WiFi and a garden. The apartment is within walking distance of a beach. This 4 bedroom house with swimming pool is located in Rotheneuf-Le Pont and sleeps 8 people. It has WiFi, a garden and garage. The house is within walking distance of a beach. This 1 bedroom apartment is located in Rotheneuf-Le Pont and sleeps 3 people. It has garage, parking nearby and a gym. The apartment is within walking distance of a beach. This 1 bedroom apartment is located in Rotheneuf-Le Pont and sleeps 4 people. It has WiFi. The apartment is within walking distance of a beach. This 1 bedroom apartment is located in Rotheneuf-Le Pont and sleeps 2 people. It has WiFi, a garden and parking nearby. The apartment is within walking distance of a beach. 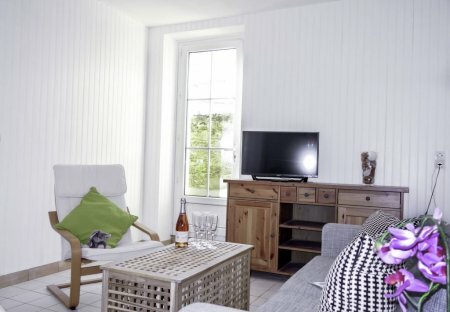 This charming multi-level terrace house is situated at a quite blind alley just outside the city walls of Saint-Malo. At the backyard there is a fabulous garden area that is enclosed. 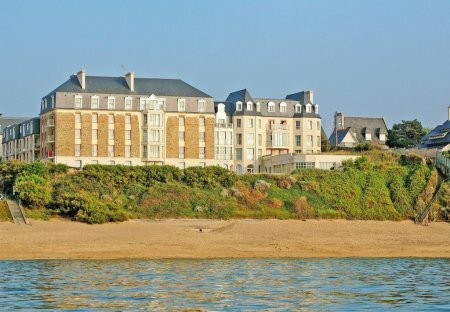 At the edge of the sea, in an exceptional setting this residence offers lovely common parts with breathtaking view on the bay of Saint Malo. The South facing.